The Sunset Strip was down and dirty well before gangster Mickey Cohen was dubbed its king and while the iconic boulevard recently got a face lift, it’s staying true to its rough and ready roots by celebrating with a multi-block rager and (the equivalent of) Gibson guitar tattoos. 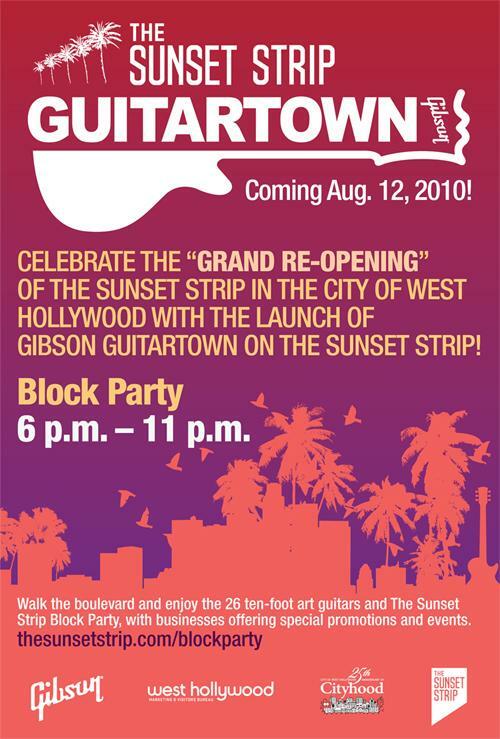 On Thursday, the City of West Hollywood, and legendary Gibson Guitars will launch GuitarTown: a public art installation of 25+, ten-foot-tall, fiberglass Gibson guitar sculptures, which will be matched with (and celebrate!) Sunset Strip landmarks such as the Whisky a Go Go, the Roxy, and the former “Riot Hyatt”: hotel of choice for rockers and the groupies who loved them. (Youngsters, see Almost Famous.) Scattered along the 1.6 mile Strip, each of the giant guitars celebrates a specific period (e.g. the Jazz Age, the counterculture 60’s), a band/artist (i.e. the Doors, Slash, Motley Crue) or a significant Sunset Strip business owner (such as nightclub founders Lou Adler, Mario Maglieri and Elmer Valentine of The Roxy Theatre, Whisky A Go-Go and Rainbow Bar & Grill.) The Strip officially “re-opens” at 5:00 at the Comedy Store and the Andaz West Hollywood with a ribbon cutting ceremony and a classic car caravan; the names of the artists who created the guitars will be revealed at the press conference at the Rainbow at 6PM. Mark your music mojo maps accordingly, Go Go’ers. After the artist accolades, check out their guitars while taking advantage of block party bonanzas such as a $14.95 “old-fashioned fish fry” at House of Blues, The London Bar‘s “London After Five” offerings ($5 cocktails, $5 bites and $5 valet parking on August 12 plus a signature $5 “London Sunset” cocktail all week) or a complimentary cocktail (one per guest) at the Den for guests who present a Sunset Strip GuitarTown map. You can also prolong the party with all night or extended happy hours at The Olive Kitchen+Bar, Carney’s, Duke’s, the Standard, and BLT Steak. Super-tight glitter tights and plexiglass platforms probably not advisable attire. You won’t just find art on the street. The Comedy Store will feature an exhibit of historic photos of the night spot from the legendary Ciro’s days (1940) to the present; the front bar will be open through the night and Happy Hour wine and hors d’oeuvres will be available on the patio from 5-7PM. RH at Andaz (formerly the infamous Sunset Marquis, where the maids would line up half-smoked joints on the window sill after cleaning rooms) offers $5 beer, a “Sunset Strip” Cocktail for $7, and $6 gourmet bar bites for Block Party guests to enjoy along with an art exhibit and two “Rock ‘n Roll walls” (’cause three’s a crowd and one is the loneliest number). Several stores will offer Block Party discounts but Dan Deutsch Optical reigns supreme amongst the rock ‘n roll retailers with complimentary beverages, a rock ‘n roll memorabilia gallery and Rayban Wayfarer giveaways. They’re matched in awesomeness by Tattoo Mania, which is offering $20 piercing on 8/12. Some exceptions apply. Which means Thursday is probably not the day to get your Nikki Sixx tribute portrait tattoo.